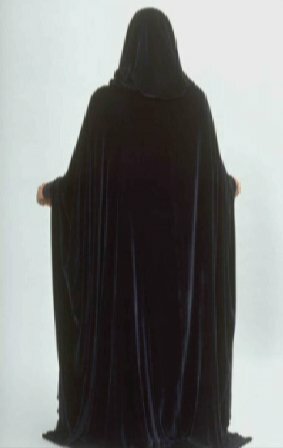 We see Arwen in a dark cloak only a few times. Even with color grading, it appears to be midnight blue velvet. but major guess. We see her cloaked again as she decided that the shards of Narsil should be re-forged into Anduril. The cloak is very hard to see. It is undecorated, but that allows the silk velvet to flow by itself. The design is elegant. It's hard to tell if this is a "U" shape or there are arms. By the way the edges flare... it look like the same zigzag edge we see on the Requiem Gown. full, big, large but very fuzzy and dark, not much beyond a silhouette.